Orbiter 2010 takes flight simulation to a whole new level. Instead of being limited to airplanes flying from Vancouver to Hong Kong, Orbiter takes players to the Earth's orbit, providing a realistic space flight experience which respects the laws of physics. You start your flight by launching from the Kennedy Space Center, rendezvous'ing with the ISS above the Earth's atmosphere. 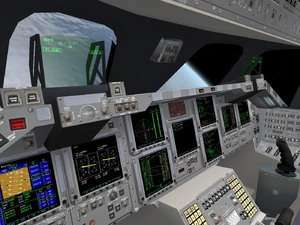 From there, you're able to fly some realistic spacecraft giving you the ability to simulate some futuristic spacecraft. Version 1.00.830 is a freeware program which does not have restrictions and it's free so it doesn't cost anything. For security reasons, you should also check out the Orbiter 2010 download at LO4D.com which includes virus and malware tests. Additional screenshots of this application download may be available, too. Orbiter 2010 has a presence on social networks.